Kevin Piper, the Chair of Surfrider Foundation CSUCI Club has been a true advocate in protecting our oceans and exemplified this on Cesar Chavez Day. 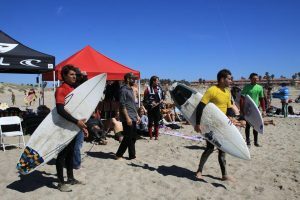 Kevin Piper and the Surfrider Club teamed up with Keegan Carrico, the president of the Surf Club and the Surf Teams’s captain, Austin Finley to host the third annual Cesar Chavez surf competition. 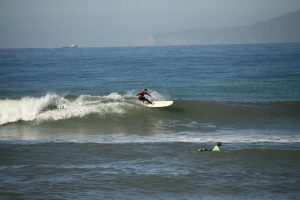 It took place on Thursday March 31st at Oxnard Beach. They wanted to host something that the students could enjoy all together and promote sustainability, encouraging everyone to bring their reusable water bottles and have refill stations for them. There were 200 people in attendance to watch the surfers compete from 8am to 4pm. Sponsors helped make this happen including Revolution Surf Co., O’Neill, Gamut, and Channel Islands Surfboards. 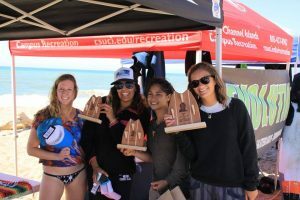 For the competition, there w ere three categories and multiple heats for the surfers to participate in including, men’s longboard, men’s shortboard, women’s longboard, and women’s shortboard. There were 24 competitors in total and multiple winners. Congratulations to our first place winners, Chase Stavron, Kylea Shields, and Austin Finley! The beach looked spotless after with spectators and participants being mindful of their trash. Volunteers even put on vests and cleaned up the beach during and after the contest. There was an overwhelming effort to rise above plastics and keep our beaches clean. Thanks to the Surfrider Foundation at CSUCI, the students are more aware of sustainability and are encouraged to make efforts against pollution in our oceans. Thank you Surfrider Foundation CSUCI Club, The CSUCI Surf Club and Team, the Sponsors, and all of those who came out in support. It was a truly spectacular event.